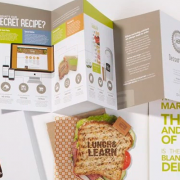 The Future of Digital Imaging and Changing Marketing Ideals were the hot topics at our Lunch & Learn this year. We invited guests from all across the country to take part in the activity and celebrate the future that digital imaging holds. 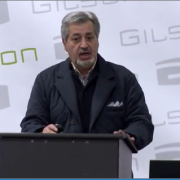 Guest speaker Frank Mallozzi from EFI talked about the leaps and bounds the industry has taken in a fun and informative presentation that was a smash hit! This year’s theme was digital imaging, so we went retro and made a fun Polaroid-themed invitation that we used as the overall theme for the event. 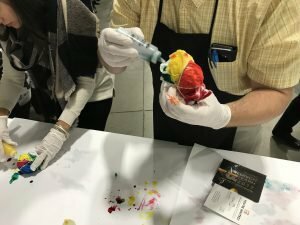 We also offered fun tie-dye stations, samples and info from our sponsors Veritiv and Mactac, as well as tasty food and great conversation about new innovations in the industry. 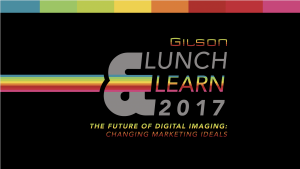 Gilson Graphics Lunch & Learn 2017 Invite. 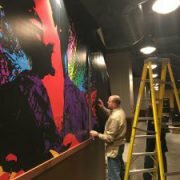 Frank Mallozzi is Senior Vice President of Worldwide Sales and Marketing at EFI, a world leader in customer-focused digital printing innovation. He now leads the successful global sales and marketing operations for the print industry’s most robust, comprehensive product portfolio. Frank Mallozzi (Senior Vice President of Worldwide Sales and Marketing at EFI). 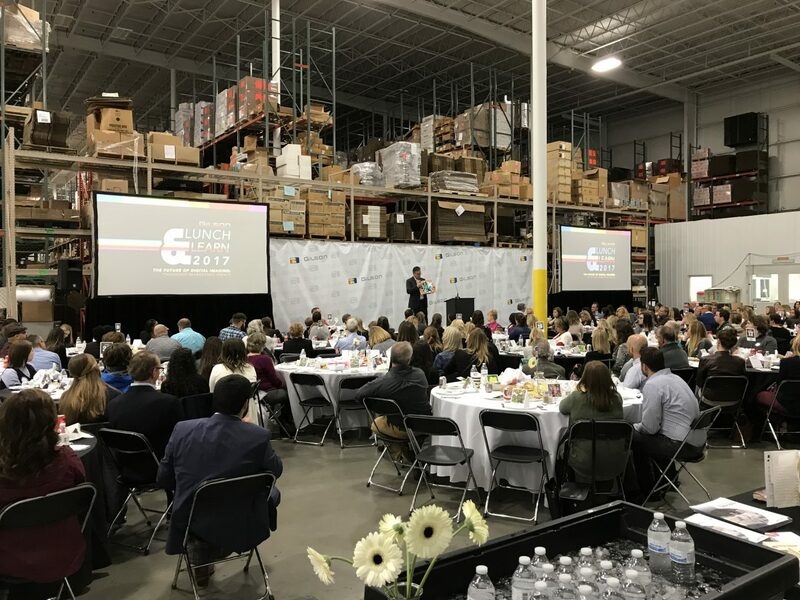 At our Lunch & Learn he discussed the future of print and digital imaging, talking about the importance of direct mail, innovations in large format, and how customization and personalization is the future of the industry. 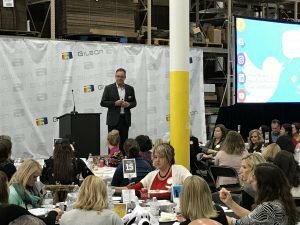 Not only were his talking points informative, but Frank made the presentation fun and exciting as he shared what the future holds for print and digital imaging. Our guests were given more than just a fantastic presentation—we had lots of activities to keep them busy! We had tie-dye stations where they could dye clothing, which was more popular than we could’ve guessed! 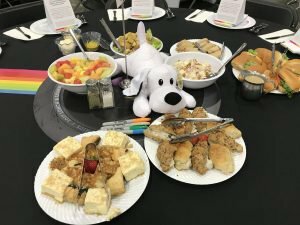 We also had white stuffed dogs for K9 for Kidz, where we’ll be donating the decorated pups for local firefighters to hand out to children in need. Our guests did a fantastic job decorating the pooches and we can’t wait to deliver them. Blank K9 ready for decorating! We also had a contest with a printable promotion that fit with our retro imaging theme. 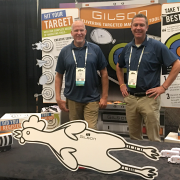 During the event, we had guests take pictures and post them on social media with the hashtag #gilsongraphics. Then we pulled the images and printed them for people to take on photo paper in a template that looked like old-school Polaroid photos. Why Polaroids? Because everyone who took a picture was entered into a contest to win awesome new Polaroid products! We gave away one new Polaroid camera and two bluetooth printers. 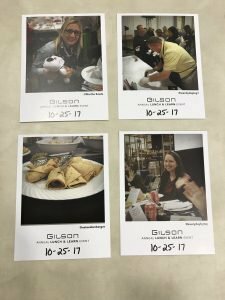 Printed photos from guests at Lunch & Learn 2017. 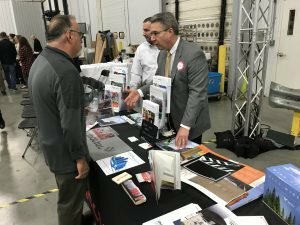 Our other sponsors and partners at the event were Veritiv and Mactac, who showed off some of their varied products and services that can be brought to new innovations in the print industry. Veritiv specializes in packaging, print, logistics and facility solutions and Mactac’s products are used in a wide range of industries including label printing, graphic design, packaging, digital imaging, and more. Guests were thrilled to see new adhesive technologies and fun applications that can be used for any creative project. 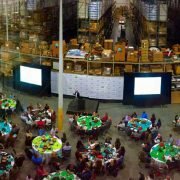 This year’s Lunch & Learn was a huge success, but not just because of the presentation, the activities, prizes, or partners—it was a success because we got to spend an afternoon with clients and share what’s new and exciting in our industry. 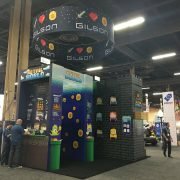 We’re thrilled that so many people wanted to tour our offices and share our love of the future of digital imaging, and we’re looking forward to making it an even better event next year. Are you interested in joining our Lunch & Learn next year? Visit our website and contact us to be added to the contact list for next year’s event.